We know you have missed the usual summary from the YaST trenches. But don’t panic, here you got it! As usual, we will only cover some highlights. libzypp has a nice feature that enables packages to display notifications when they’re installed/upgraded. Zypper takes advantages of this feature and shows that information when a package is installed/upgraded. For example, if you install mariadb package, Zypper will inform you about setting up a database root password and so on. If you installed any of those packages with YaST, you missed that piece of information… until now! 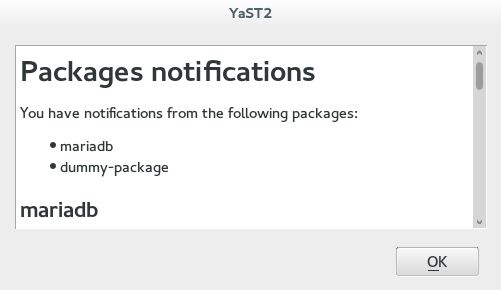 Starting on yast2 3.1.175 YaST will show packages notifications. The only exception is when doing a regular installation (or autoinstallation), as we want to show as few dialogs as possible. 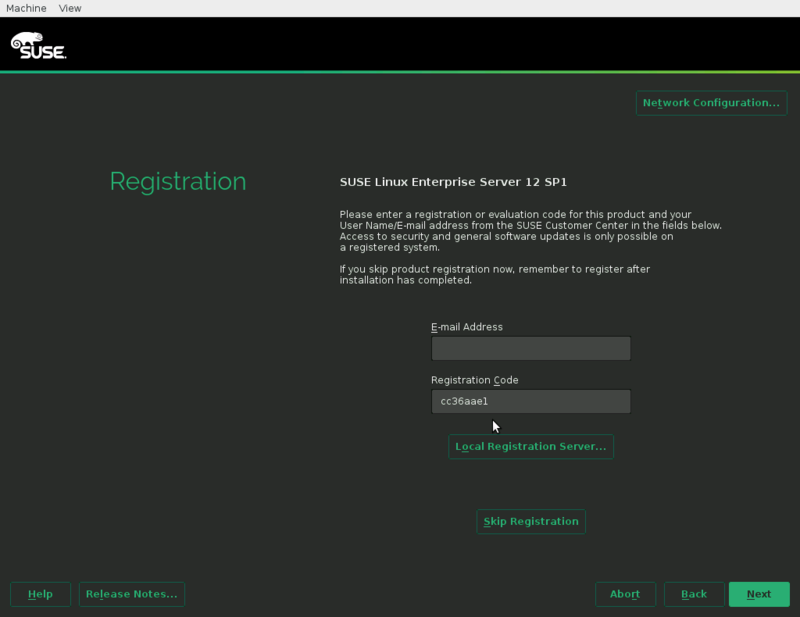 During the installation of a SUSE Linux Enterprise product, you are asked for a registration code. Previously you had to remember it and type it by hand. Now the code can be read from USB storage. Insert a USB stick at installation boot time or at the latest before you proceed from the first installation screen (Language, Keyboard and License Agreement). That stick should contain the registration codes either at /regcodes.txt or at /regcodes.xml. In the registration dialogs, the input fields will be prefilled. The syntax of the files is as follows. In the file identify the product with the name quoted by zypper search --type product or SUSEConnect --list-extensions (without the /version/architecture part). We also invested quite some time improving the support for Btrfs in the expert partitioner. Implementing one requested feature and closing five bugs. The following animation shows the feature #320296 (user friendly handling of subvolumes) in action, together with the fix to 965279 (Btrfs settings always overridden with default values). But we have even more screenshots and animations for the improvements in the expert partitioner. In the description of this pull request, you have screenshots displaying the new dialog that was implemented to fix bug#928641. And in this other pull request, you can see in action the fixes for bug#944252 (snapshots were offered for partitions other than root) and for bug#954691 (fstab options being forgotten for Btrfs partitions). In recent posts, we reported how we are about to refactor the storage subsystem of YaST. The improved partition proposal for installation presented in the previous summary performs a lot of operations – like analyzing what disks are there and what is on each one of them, checking if there already is enough free space and making a best guess on what partitions may be candidates to be removed to make space for a new Linux installation. If there are many disks with many partitions, this can get complicated really quickly. So we need a reliable way to test it. Thus, we created a testing framework to build fake storage hardware (disks) with fake partitions and file systems. Although it’s fake hardware (we can’t create hard disks out of thin air… yet), it enables us to do unit tests without setting up virtual machines. With those tests we can cover a lot more scenarios that would otherwise be really difficult to test, with one or many disks, with many partitions of different kinds, with a previously existing RAID array or whatever. One nice thing about the new libstorage is that it operates on “device graphs” that can be transformed into the GraphViz format for easy visualization. Here you have a nice diagram generated by libstorage based on some fake hardware created from this YAML specification. 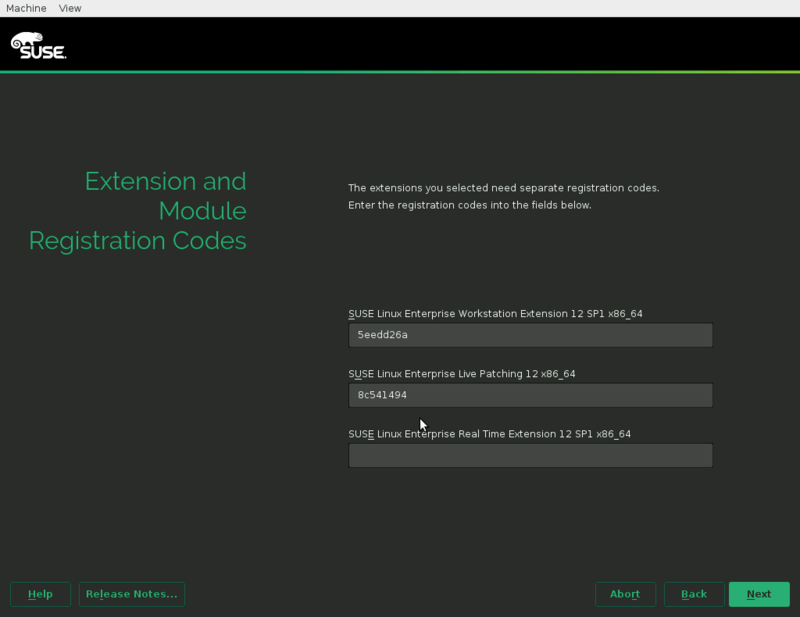 We also spent some time improving the usability of the section for registration of extensions and modules. Now if the user selects several modules and the registration of some of them fails, the user will be kindly redirected back to the same dialog but only with inputs for the unregistered ones. From there, they can go back to unselect the failing extensions or retry with different (or even with the same) codes. As the last step of the improvements done to the user creation dialog (see the previous post for more details). We removed the long-ago meaningless checkbox titled “Receive System Mail”. That leaded to the removal of quite some code… and removing code is usually a good thing. As usual, this is just a short summary with some highlights. Many other stuff was implemented and several other bugs were fixed but, you know, we cannot blog about everything if we want to invest some time in debugging and coding. See you in the highlights for next sprint, in around three weeks. PS.- If you want to be part of the fun, take a look to the YaST-related summer projects we have on the openSUSE mentoring page.